During our workshops, participants will learn dual techniques and principles necessary to assist bilingual audiences. Each workshop will include small group discussion, problem solving scenarios and an evaluation. In each training session, participants will be exposed to different artistic expressions. All presentations follow a simple and systematic structure which is easy to understand and can be immediately applied in a participant’s workplace. In this interactive workshop participants will learn artistic, marketing and community outreach strategies in working with the Latino community for library programs. The presenters will share concrete step by step case studies of implemented intercultural programs, demonstrating the many connections across art, learning, community and literacy. Participants will also learn some dual techniques and principles necessary to assist bilingual audiences. The workshop includes small group discussion and problem solving scenarios. This workshop is based on a video that Criss Cross Mangosauce co-produced for the Collaborative Summer Library Program called Storytime Techniques. Any Language. Any Community. In this video, we showcase our bilingual techniques as we understand that English is not the primary language of all stortytime participants or their caregivers. Also we know that English-speaking caregivers often want to expand their young charges view of the world and vocabulary with words or songs from other cultures in other languages. This workshop offer 10 years of practical ideas on how to celebrate this national day in your schools, libraries and educational settings. 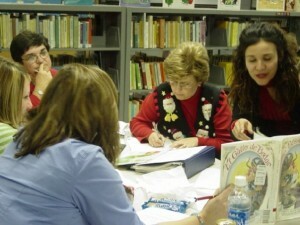 Participants will learn techniques on how to recognize high quality, culturally authentic bilingual children’s picture books. After sharing a world of multicultural books and music, teachers and parents will understand what means to be a multicultural reader. This workshop focuses on how to use bilingual literature in a library or school program. Participants will learn how to search and choose good literature for the bilingual child and his/her parents. Participants will also learn useful techniques to use when reading to a bilingual child, including Total Physical Response (TPR) and Natural Approach teaching methods.